Look at the closest lamp. I’m betting that’s the first time you’ve even done that since you put it there. They go unnoticed or appreciated; their stark lifeless forms providing a dull necessity month after month, year after year. The Lampster on the other hand provides that same simple human necessity while looking far braver than any lamp before it. The face of the Lampster is made using a reused tractor headlamp mounted on an aluminum neck that allows the head (or light) to pivot in the direction you need it. 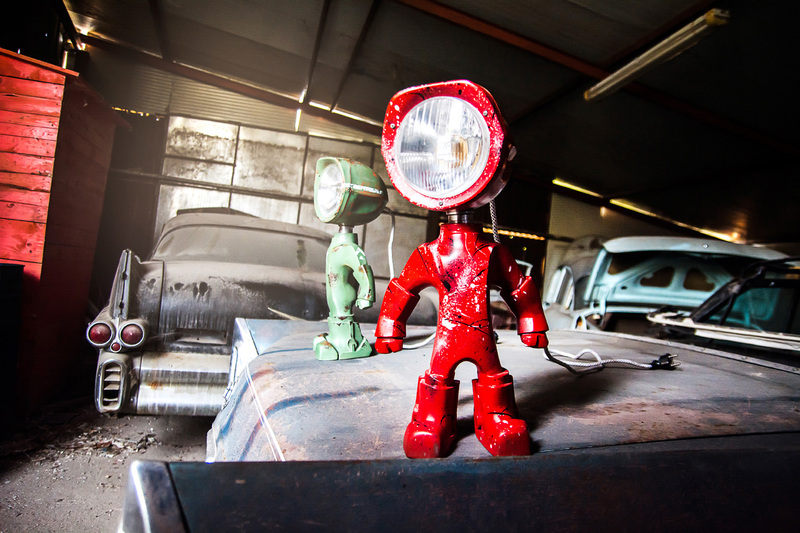 Standing about 19″ tall the body of every lampster is hand painted and uses rubber insulation around the electronics to make it water resistant. Not one to be limited to merely one light, the Lampster uses two: one clear LED activated by a touch of the polished brass button on top of the head, and another RGB LED, which can change colors and intensity via a paired smartphone. The Lampster’s Kickstarter campaign has already exceeded its funding goal by 4x and can be pre-ordered with a $149 pledge. We look forward to seeing it liven up bleary desks everywhere soon.